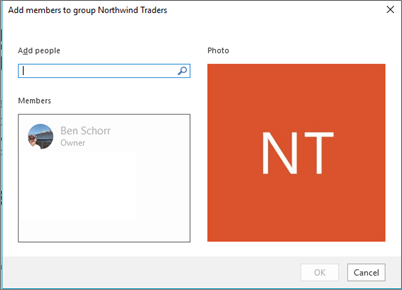 You've heard about Office 365 Groups and how you can use them in Outlook, but perhaps you're not sure how to get started. In this article we're going to walk you through a few basic steps for how you and your team can get started with Office 365 Groups in Outlook. We'll also give you some links to more in-depth content for when you're ready to do more. If you're not sure what groups are, you may want to visit Learn about Office 365 groups first. To get the most from Office 365 Groups in Outlook you need to have an Office 365 plan that supports Exchange online and SharePoint online, such as Business Premium, E3 or E5. Note: In order to use Office 365 Groups in Outlook 2016 you need to be using Outlook in Cached Exchange Mode. For more information about that see Turn on Cached Exchange Mode. Select a tab below to find more information about getting started with that feature. Click New Group from the groups section of the Ribbon. If you're using Outlook on the web instead of the desktop version you can start this process by clicking the drop arrow next to New and selecting Group. Give your group a name. Set the privacy setting. Groups are Private by default. This means they can only be viewed by members of the group and require a group owner's permission to join. Public groups can be viewed, and joined, by anybody in your organization. Neither setting exposes your groups to people outside the organization unless you specifically invite them as guests. Tip: Groups are Private by default when they are creating using Outlook on the web. In coming months, they will be Private by default when created using any of the Outlook apps. Decide if you want new members to follow the group (Advanced options). Members who follow the group will get copies of each group message in their personal inbox. Members who are merely joined will have to go to the group's shared inbox to participate in group conversations. For more information on creating a group see Create a group in Outlook. For more information about joining a group someone else has created see Join a group in Outlook. For more information about how to stop receiving group messages in your Inbox or to exit a group altogether see Leave a group in Outlook. Go to your group in Outlook 2016 by finding it on the navigation pane at the left. It should be below your mailbox in the Groups section. Once you're in your group click Add Members on the Ribbon. If you're using Outlook on the web click where it says how many members your group has, near the top right of the window, then click Add members. Type the name or email address of each person you want to add in the field provided. When you're done, click OK and they'll be added. Each of them will receive an email message welcoming them to the group and giving them convenient links to access group content. Tip: If you want to add all of the members of an existing distribution list, just type the name of the distribution list and they'll all be added in one step. For more information about inviting guests from outside your firm to your group see Guest access in Office 365 groups. 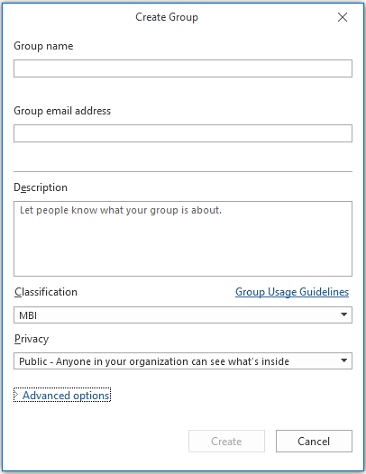 For more information on adding or removing members from your group see Add and remove group members in Outlook. Conversations in Office 365 Groups in Outlook happen in the shared inbox for the group. There users can read and reply to messages, and members can easily search or scroll back through the message history to get caught up on what's been discussed before. The shared inbox looks a lot like the personal inbox that Outlook 2016 users are familiar with. Each conversation appears separately in the message list at the left and clicking on one will open it in the reading pane. Tip: Conversations in an Office 365 group in Outlook appear stacked - which is to say as a single post that you scroll through as opposed to a thread of individual messages. If you prefer to see them as individual messages, follow the group and you'll receive the individual messages in your personal inbox. Now that you've got your group created, let's start a new conversation. You can post a new message by opening the shared inbox for the group and clicking New Conversation on the Ribbon. Or you can simply send an email to the group's alias. All members of the group will be able to read the new message you've posted and any members who follow the group will get a copy of your message in their personal inbox. If you'd like to use Outlook on the web see Have a group conversation in Outlook. Each Office 365 Group gets a shared files library where you can store, share, and collaborate on documents, workbooks, presentations, or just about any kind of file. Access the files library by going to your group in Outlook (on the left navigation pane) and click Files on the Ribbon. The files library will open in a browser and from here you can create new files, upload files from your computer and do just about anything else a SharePoint document library can do. Think about what kind of files would be useful to share with your group, and don't feel limited to Microsoft Office files. You can also share PDFs, photos or just about any other kind of file that your group would find useful. To download or delete a file just select it and those options will appear on the toolbar at the top. For more information about working with files in your group see Share group files. Each Office 365 Group gets its own shared OneNote notebook where they can gather ideas, collaborate and store research. Go to your group in OneNote 2016 by finding it on the left navigation pane, or in Outlook on the web by going to the People tile. Once you're there click Notebook on the Ribbon to open the group's shared notebook. The first time you open the group's shared notebook it will open in the browser in OneNote Online. You can make edits there, or if you have OneNote 2016 and you'd prefer to use that just click Edit in OneNote from the Ribbon. Once you've opened it in OneNote 2016 the notebook will sync to your list of open notebooks in OneNote 2016 and you can access it directly from within OneNote without having to go to the group first. Try going to your group's OneNote notebook and think about what might be useful for the group to collect ideas and collaborate on. For example you might have a section that you use to gather and comment on web content and articles that are relevant to your team. Note: Your group notebook is also available to you on your smartphone or tablet using OneNote for iOS or Android. To get started with OneNote see Basic tasks in OneNote 2016 for Windows. Chances are good that your group has events, meetings, milestones or other items that would benefit from a shared calendar. 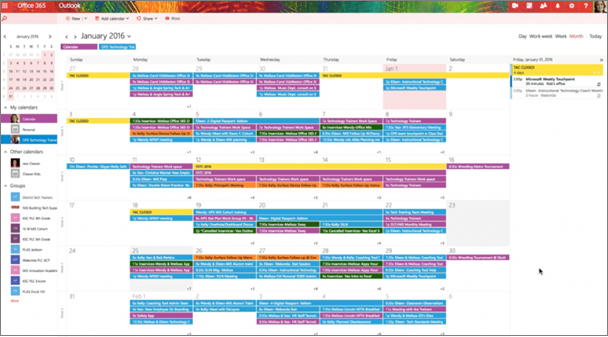 Each Office 365 Group has a shared calendar that all members can see and contribute to. Working with the calendar of your group is no different than working with your personal calendar. If you select the calendar button on the navigation pane, you'll see your personal calendar, plus the shared calendars of any groups you're a member of. You can check the boxes next to each calendar you want to see and view them side by side or overlapped. Adding an item to the shared calendar works just as it does on your personal calendar, though any item you add to the shared calendar will invite the other members of the group to that event as well, so they can have it on their own calendars. Now that you've got your shared calendar try adding any upcoming meetings or events that your group might be participating in. For more information on using your group's shared calendar see Schedule a meeting on a group calendar in Outlook. So now that you have your group up and running, where do you go from there? Microsoft Planner lets you assign and manage tasks for folks in your group. Get more information in Microsoft Planner help. You can invite guests from outside your organization to join and collaborate in the group. See Guest access in Office 365 groups. Migrate your existing distribution lists to Office 365 groups. See Why you should upgrade your distribution lists to groups in Outlook. Add a Microsoft Team to your group for persistent chat. See Microsoft Teams Quick Start. Visit the Microsoft Tech Community to post questions and participate in conversations about Microsoft Office 365 Groups. Diane last updated this article on April 18th, 2018 as a result of your feedback. If you found it helpful, and especially if you didn't, please click the feedback controls below and leave us some constructive comments so we can continue to improve it. Thanks!